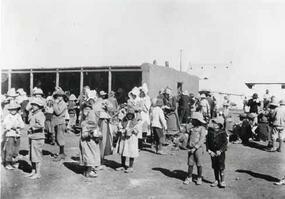 1 Caption: Boer women and children in British prison camp, about 1900. 2 The events leading to the Boer or South African War began long before the war did. Those events would bring Canada into its first international war. 3 The Boers were Dutch colonists who happened to reside near British colonies. They had two independent republics, Orange Free State and Transvaal. Boer is Dutch for farmer. 4 In 1886, gold was discovered in Transvaal. People flocked to the region. Most were British. The government of Transvaal was nervous about having so many strangers in their land. They decided to withhold political rights from the newcomers.